Yike Guo, is a Professor of Computing Science in the Department of Computing at Imperial College London. He is the founding Director of the Data Science Institute at Imperial College. He is a Fellow of the Royal Academy of Engineering (FREng), Member of Academia Europaea (MAE), Fellow of British Computer Society and a Trustee of The Royal Institution of Great Britain. Professor Guo received a first-class honours degree in Computing Science from Tsinghua University, China, in 1985 and received his PhD in Computational Logic from Imperial College in 1993 under the supervision of Professor John Darlington. He founded InforSense, a software company specialized in big data analysis for life science and medicine, and served as CEO for several years before the company's merger with IDBS, a global advanced R&D software provider, in 2009. He was then the Chief Innovation Officer of the IDBS until 2018. He also served as the Chief Technical Officer of the tranSMART foundation, a global alliance in building open source big data platform for translational medicine research. He has been working on technology and platforms for scientific data analysis since the mid-1990s, where his research focuses on data mining, machine learning and large-scale data management. He has contributed to numerous major research projects including: the UK EPSRC platform project, Discovery Net; the Wellcome Trust-funded Biological Atlas of Insulin Resistance (BAIR); and the European Commission U-BIOPRED project. He was the Principal Investigator of the European Innovative Medicines Initiative (IMI) eTRIKS project, a €23M project building a cloud-based informatics platform, in which tranSMART is a core component for clinico-genomic medical research, and co-Investigator of Digital City Exchange, a £5.9M research programme exploring ways to digitally link utilities and services within smart cities. 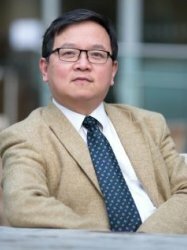 Professor Guo has published over 250 articles, papers and reports. Projects he has contributed to have been internationally recognised, including winning the “Most Innovative Data Intensive Application Award” at the Supercomputing 2002 conference for Discovery Net, the Bio-IT World "Best Practices Award" for U-BIOPRED in 2014 and the "Best Open Source Software Award" from ACM SIGMM in 2017.